6A continuous learning culture; 7.joint responsibility between managers and staff for identifying and meeting training needs. "Learning is not a spectator sport -- it is an active, not a passive, enterprise. Accordingly, a learning environment must invite, even demand, the active engagement of the student". - "D. Blocher"
Training Defined Before trying to understand system type training, we must first understand what training is. We need to clarify the definition of training and then do the same for human resource development. Training is defined as learning that is provided in order to improve performance on the present job.A person's performance is improved by showing her how to master a new or established technology. The technology may be a piece of heavy machinery, a computer, a procedure for creating a product, or a method of providing a service. Notice that the last part of the definition states that training is provided for the present job. This includes training new personnel to perform their job, introducing a new technology, or bringing an employee up to standards. 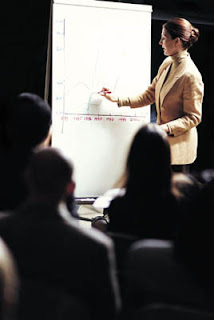 Human Resource Development DefinedTraining is part of Human Resource Development (HRD). Do not confuse HRD with the term "human resource department." A human resource department is concerned with all aspects of the employees, such as pay, benefits, equal opportunity, and of course training. HRD is concerned with training, development, and education. HRD has been defined as an organized learning experience, conducted in a definite time period, to increase the possibility of improving job performance and growth. Organized means that it is conducted in a systematic way. Although learning can be incidental, training is concerned with the worker learning clear and concise standards of performance or objectives. Having an objective is important. Without an objective, you could end up someplace else...and not even know it. Objectives are the tools for guiding managers, learners, and trainers. Managers need objectives so that they know what kind of return they are receiving from their training investment. Learners need them so that they know exactly what is expected of them. And trainers need them to plan and conduct the learning environment so that they may achieve the desired results. The second part of the definition, conducted in a definite time period, means that the amount of time the learner will be away from work must be determined and specified at the onset of the training program. The last part of the statement, to increase the possibility of improving job performance and growth, is basically the definition of training. By possibility, it means that although a organization can provide tools to help the learner succeed, such as education and training specialists, counselors, coaches, and state-of-the-art training materials, the ultimate responsibility for success belongs to the learner. Training, Development, and EducationHRD programs are divided into three main categories: Training, Development, and Education. Although some organizations lump all learning under "Training" or "Training and Development," dividing it into three distinct categories makes the desired goals and objects more meaningful and precise. Training for the present, Educating for the future, Developing to lead. As discussed earlier, training is the acquisition of technology which permits employees to perform their present job to standards. It improves human performance on the job the employee is presently doing or is being hired to do. Also, it is given when new technology in introduced into the workplace. Education is training people to do a different job. It is often given to people who have been identified as being promotable, being considered for a new job either lateral or upwards, or to increase their potential. Unlike training, which can be fully evaluated immediately upon the learners returning to work, education can only be completely evaluated when the learners move on to their future jobs or tasks. We can test them on what they learned while in training, but we cannot be fully satisfied with the evaluation until we see how well they perform their new jobs. Development is training people to acquire new horizons, technologies, or viewpoints. It enables leaders to guide their organizations onto new expectations by being proactive rather than reactive. It enables workers to create better products, faster services, and more competitive organizations. It is learning for growth of the individual, but not related to a specific present or future job. Unlike training and education, which can be completely evaluated, development cannot always be fully evaluated. This does not mean that we should abandon development programs, as helping people to grow and develop is what keeps an organization in the cutting edge of competitive environments. Development can be considered the forefront of what many now call the Learning Organization. Development involves changes in an organism that are systematic, organized, and successiveÖand are thought to serve an adaptive function . Training could be compared this metaphor - if I miss one meal in a day, then I will not be able to work as effectively due to a lack of nutrition. While development would be compared to this metaphor - if I do not eat, then I will starve to death. The survival of the organization requires development throughout the ranks in order to survive, while training makes the organization more effective and efficient in its day-to-day operations. "The goal of instruction is to overcome a deficiency in a skill, knowledge, or attitude. The designer must understand the instructional goals so that the courseware's content, layout, strategies, and activities may be built to maximize the learning experience"
The Training SystemWhen some people see or hear the word system, they think of mega-methodologies that require several bookcases and intense training to use. A System Approach to Training is not that difficult or complicated. The Instructional System Development (ISD) Model was designed to solve training problems . It is probably the most extensively used instructional design model in use today. When some people see or hear the word system, they think of mega-methodologies that require several bookcases and intense training to use. A System Approach to Training is not that difficult or complicated. The Instructional System Development (ISD) Model was designed to solve training problems. Figure 2, shown below, is a flowchart of the ISD model. It was first established by the Department of Defense, but can now be found in almost any type of organization. It grew out of the "systems analysis" concepts that became popular after World War II. It is probably the most extensively used instructional design model in use today. ISD is concerned with the identification of training requirements based on the analysis of job performance requirements data obtained from experts in the job to be performed. Training objectives are formulated as a result of the job analysis process and tests are developed to be used to assess the learner's progress toward meeting the training objectives. ISD or SAT also attempts to bring structure to the instructional design process when determining the optimal instructional strategies, instructional sequencing, and instructional delivery media for the types of training objectives involved. Analyze the system in order to completely understand it, and then describe the goals you wish to achieve in order to correct any shortcomings or faults within the system. Design a method or model to achieve your goals. Develop the model into a product (in training, this product is called courseware). Implement the courseware. The flowchart model used in Figure 2 (shown above), shows the five phases with their basic steps listed below them. Although the above model shows the processes, it does not really show the dynamics of the ISD model. For that purpose, Figure 3 is used. This figure highlights the importance of evaluation and feedback throughout the entire training program. It also stresses the importance of gathering and distributing information in each of the five phases and shows the training process is NOT a static (waterfall) model, but a iterative flow of activities (dynamic or spiral). The five phases are ongoing activities that continue throughout the life of a training program. After building a training program, the other phases do not end once the training program is implemented. The five phases are continually repeated on a regular basis to see if further improvements can be made. Analyze : Analyze system (department, job, etc.) to gain a complete understanding of it. Compile a task inventory of all tasks associated with each job (if needed). Select tasks that need to be trained (needs analysis). Build performance measures for the tasks to be trained. Choose instructional setting for the tasks to be trained, e.g. classroom, on-the-job, self study, etc. Estimate what is going to cost to train the tasks. Design: Develop the learning objectives for each task, to include both terminal and enabling objectives. Identify and list the learning steps required to perform the task. Develop the performance tests to show mastery of the tasks to be trained, e.g. written, hands on, etc. List the entry behaviors that the learner must demonstrate prior to training. Sequence and structure the learning objectives, e.g. easy tasks first. Develop : List activities that will help the students learn the task. Select the delivery method such as tapes, handouts, etc. Review existing material so that you do not reinvent the wheel. Develop the instructional courseware. Synthesize the courseware into a viable training program. Validate the instruction to ensure it accomplishes all goals and objectives. Implement : Create a management plan for conducting the training. Conduct the training. Evaluate: Review and evaluate each phase (analyze, design, develop, implement) to ensure it is accomplishing what it is supposed to. Perform external evaluations, e.g. observe that the tasks that were trained can actually be performed by the learner on the job. Revise training system to make it better. The steps in each phase should not be thought of as concrete in nature. That is, one step does not have to be completed before the next one is started. For example, some training designers will have to complete part of the work in the design phase before they can complete the estimate step in the analysis phase. In the development phase, the first three steps, list learner activity, select delivery system, and review existing material, might be combined into one step by many developers. Every training project will develop its own rhythm. The developers must find the natural flow of the steps required to produce a successful training program. Although the SAT process is a formal one, in that the five phases should be performed as shown in the flowchart, it requires both art and science in its implementation. An early focus on the clients must be maintained. This is done by direct contact with the clients through interviews, observations, surveys, and participatory design and development methods. You must ensure that the clients are made owners of the training program throughout the entire SAT process. If they feel the program is being shoved down their throats or their turf is being invaded, the program will fail. The five phases - analysis, design, development, implementation, and evaluation should be under one management team to ensure that a symmetrical program is constructed. The design must be an empirical one. This requires observation, measurement of behavior, careful evaluation of feedback, and a strong motivation to make design changes when needed. The process of implementation, testing, feedback, evaluation, and change must be repeated throughout the training system's life to improve upon it. Do NOT fall into the old adage, "If it ain't broke don't fix it." Make it better before your competitors do! Records must be maintained. The audit trail should contain the data gathered in the analysis, the reasons for developing a piece of courseware, and documents that explain why certain decisions were made. This information could prove invaluable in the future when changes are needed or when a similar program must be built.